It would seem that in this age of continuous advancement, people are becoming more cautious to new ingredients and methods and instead are going ‘back to basics’ when it comes to products they apply to their skin. In fact, when asked about their beauty secrets in a recent survey by skin health brand, Sanex, all respondents made reference to leading a healthy lifestyle and looking after their skin. One respondent summarised her secret as ‘just taking care of what I eat and always being aware of products that I use on my face and body’. The survey also revealed that the top natural products people regularly opt for are shampoo, conditioner and shower gel, with the most common reason stated for this natural choice being that they believed them to be kinder on their skin. In addition to this, a whopping one-third said they would definitely opt for a more natural deodorant if it was easily available. The natural world is capable of sustaining itself and contains and produces all it needs to protect and renew. Your skin works in much the same way and is capable of helping to regulate body temperature and naturally protecting itself. Sanex understands your skin and how it works, so in response to this, has become the first mainstream brand to offer a more natural solution to body odour control, by turning to nature to help develop new Sanex Naturprotect deodorant. 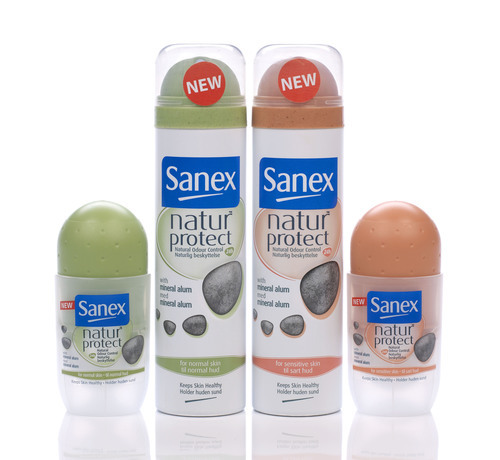 Naturprotect is a more natural, yet highly effective deodorant that is kind to your skin. It contains the mineral alum – a natural compound – that actively works with your skin to counteract bacteria and protect against body odours, whilst letting your skin breathe. Alum has been used for hundreds of years for its deodorising and antibacterial properties. It provides a natural alternative to other aluminium-based ingredients on the market. Many users, especially those with sensitive skin, often feel that using a deodorant with natural ingredients, such as alum, is less irritating.